The holiday gift scramble is real and by now you may be feeling it this year. But fear not, you still have time to make plenty of homemade gifts without adding any more stress to your holidays. That's why I am sharing my favorite homemade gifts this week and next. This week we are focusing on edible gifts you can bring for the host of your next holiday party. While the common gift of a bottle of wine or liquor is still a great gesture, you may want to bring something a little different that your host can enjoy. That's where these three homemade holiday gifts come in. All three edible gifts can be made in advance and are ready for you to grab on your way out the door to your next holiday party. They can all also be served in simple mason jars dressed up with a little bit of holiday ribbon to make them look festive. So go get started and make these gifts, you still have plenty of time! Festive and delicious, this Healthier Hot Cocoa Mix will be a welcome treat for your party host. Who wouldn't love a jar of healthier hot cocoa mix? Made with raw cacao and coconut sugar, this is a hot cocoa you can feel good about gifting. 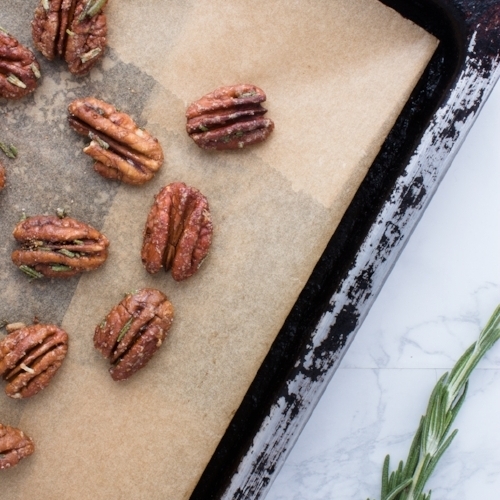 Spiced or candied nuts like these Maple Glazed Rosemary Pecans are perfect for the host who always likes to be prepared for guests. In a season filled with parties, stand out from the gifted bottles of wine with a jar of candied nuts for the host instead. While there are plenty of spice and flavor combinations to use, you can start by trying these Maple Glazed Rosemary Pecans or Cacao & Chili Dusted Almonds. Homemade nut butters seem like that would be difficult to make but they are incredibly easy and you can add whatever flavors you like. A healthy treat your host can enjoy for weeks to come, homemade nut butters can be customized to whatever flavors you like but you can start with this Cinnamon Pecan Butter which is slightly sweet but definitely rich.